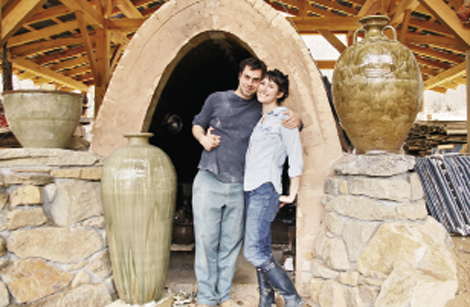 Between mixing clays, crafting thousands of functional and decorative pottery pieces, blending his own glazes, and firing his creations in a self-built kiln, it’s a wonder Alex Matisse of East Fork Pottery in Marshall has time to host a fête. But for Matisse and his partner, Connie Coady, a successful firing—a process that takes about a week—is an occasion for friends and food. They host a kiln opening and sale twice a year, and the next is November 18-20. Friday night kicks off the event. “We’ll be firing the week before the opening. It takes about four days for the pots to cool, which needs to happen slowly so nothing cracks,” Coady explains. “Ninety percent of the pieces on display will be fresh from the kiln.” Highlights in this batch include a teapot inspired by Eastern ceremonial styles, ornamental closed-form pots, decorative shields, as well as vases, platters, bowls, and mugs. The event is as much an unveiling for Matisse as it is for visitors, since the final product isn’t revealed until the hardened clay and glazes cool.